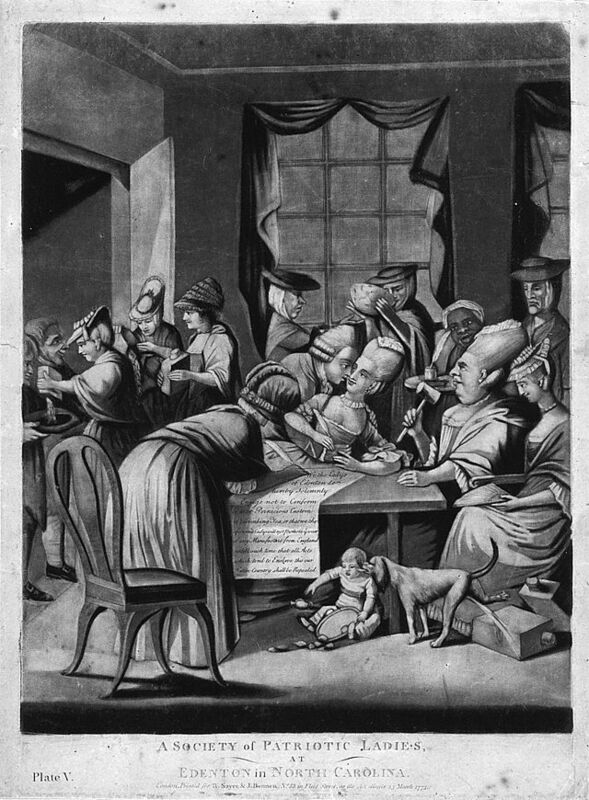 On October 25, 1774, women in Edenton resolved to stop buying English tea and cloth to protest taxation without representation. The event became known as the Edenton Tea Party. The women, some of whom likely gathered at a home in Edenton, drew up resolves which were signed by 51 local ladies. In January 1775, a British newspaper reported that “many ladies of this Province [North Carolina] have determined to give a memorable proof of their patriotism” having resolved not to drink anymore tea or use any British cloth. The step was a momentous one for colonists, because drinking tea was an English tradition that defined social gatherings. To suspend the custom, which was a part of everyday life, showed just how disgusted they were with the English government. Like the much more famous Boston Tea Party, the Edenton Tea Party was a bold demonstration of patriotism and the belief in individual rights. Penelope Barker, wife of the treasurer of the Province of North Carolina is believed to have organized the protest.